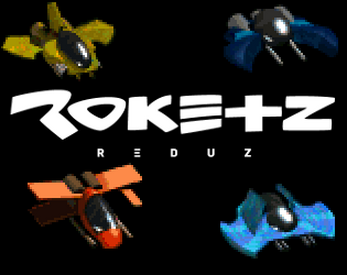 Roketz Reduz is a re-imagining of the classic game "Roketz" originally developed for the Amiga and DOS by Bluemoon Interactive and The Farm. Using original content from both the Amiga and DOS versions of the game (with permission from the original developers), this new version is designed to be a 'best-of' the original game - with a modernised feel and new features thrown in! Fly noisy little craft around cramped industrial environments and try to kill your fellow space dudes in this classic multiplayer cave-flyer game. Cram your ship with weaponry and useful equipment to compete in either combat or racing modes. Gamepad support - X-Box (360 or One) pads are highly recommended! 9 levels taken from the original DOS version of the game! 4 different Roketz to fly/crash! 16 weapons, 8 different selectable pieces of equipments! Deathmatch and a very buggy Checkpoint Race mode! So This Thing Is Early Access? This is an unfinished, prototype game, but is in a playable state. I'm currently looking for an artist to collaborate with in order to finish the last few remaining bits and pieces that need to be done. I'm hoping that with the support of the community I can develop this game to it's full potential and revive the once great multiplayer cave-flier genre! My plans range from simply polishing what is already present, adding a single player progression mode and unlockable weapons/equipment right through to adding entirely new environments - it all depends on the level of support and interest of you, my dear gamers. So please support my little game and help me to continue developing it! At the moment I'm one guy - Adam Bradley-Cooper, calling myself Sawtooth Games. And also to Tyler Barber - artist extraordinaire - for making the Roketz Reduz and Sawtooth Games logos! StickyPost bugs in here please!